Oh these pictures, the story behind them and the outfit are just lovely. That skirt is beautiful and I like the theme of these photos. Picking raspberries sounds divine! I love these photos and your skirt! You look so nice!! These are such amazing photos, and I love your skirt!! Also, I just read that you're going to the Big Chill, me too!! Hope you have a good time! Such a beautiful skirt, you take the prettiest pictures! i'm admiring not only your vintage outfit, but that epic landscape! I think the way you live is amazing, so wild and free! you wear the prettiest dresses and take photos in meadows and near the sea, places where there are no limits and control. I also admire the relationships you have with your parents. No te suelo contestar a los post, pero tengo que decirte que me encantan¡¡¡¡ tus estilismos son geniales y posas como una auténtica modelo. ¿Has pensado en dedicarte a ser modelo???. Eres preciosa y tienes mucho estilo. Besos. love ur blog. u look beautiful in that outfit. really really love this, great post - enjoyed reading it! LOVE this post! Your outfit is just lovely, and the picnic theme is great! Thankyou so much for the sweet comment and for visiting my blog, it really means so much! I need to stop saying: this is my favorite post of yours so far, because you inevitably make another post, that is best too. Pics= goosebump chillingly gorgeous. Some of the photos LOOK just like a fashion editorial, VOGUE quality. So good. Thermal = genius. You took a vintage look and made it modern by this addition of this humble garment. Your writing is simply brilliant. Engaging, intelligent without being cheeky or overly clever. Heartfelt. LOVE your writing skills almost as much as I love your photoshoots. that outfit with the jacket is so amazing. great job! What a beautiful skirt! I love the books and teacups setting. Love your more frequent use of movement recently, it completely accentuates the clothes at their best, how they are supposed to be; worn. Yes, I completely agree that the sense of accomplishment will always arise when something has been foraged, regardless of what it is. I guess it does accentuate qualities one would hope they would possess; initiative and assertiveness. However, I must say, that sense is somewhat magnified when clothes are involved! wow, I just love this skirt! All this talk of berries is making me want a big bowl of them. Ps: have a lovely time at the festival! Loved the pictures, great blog btw, check out ours whenever you want. I really love your pictures!! loving the layering! you have an awesome unique beautiful style! you have a great blog, keep it up and ill be back for sure! 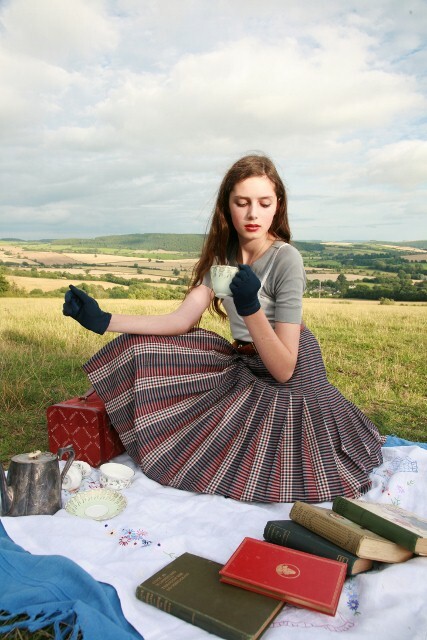 Hmm tea, old books, full skirts... the eccentric english rose! Love it alottle. Hello darling, I have just read your section in Style magazine and I must say you are absolutely inspiring. I hope you keep your innocent/mature/positive attitude to life and style, it's turning you into an icon! Just opened up Sunday Times Style magazine, turned instantly to my favourite page and saw you! I've never been on your blog before, but ou dress so beautifully! And I love reading all about what you're doing, many bloggers bore me, but you're actually interesting! Now I'm going to find out that I've got the wrong blog address, but it certainly looks like you! Just found your blog, having seen it in The Sunday Times style magazine.....well done! I have since been mesmerised & scoured every post you have made!I find your style truely inspirational! I too, hoard moutains of vintage gear & I totally share your passion.Really looking forward to following your blog. I found your blog after seeing you in the 'What are you wearing?' section of Sunday Times Style magazine and I love the way you put outfits together - it looks so natural but polished! I was wondering if you would consider writing a blogpost about your hair and beauty preferences/routine? I was about to come on here and say how i saw you in the Sunday Times Style magazine, but it seems i was beaten to it! Blog looks good, you're so lucky you found something you enjoy doing! You have inspired me to start a blog (felicityotoole.blogspot.com) although it is not quite as well themed as yours. I'm new to your blog, and it's lovely!! What a cute cute skirt you have on! I love it so much. And the books have very nice colors. Hah. Great blog! Oh, and I just made a blog yesterday, and i was wondering if you can check it out when you have time. Thanks! I love your photography! I'm a fellow fashion photographer myself, and found your blog from Teen Vogue's girl of the week. Bravo! Oh you are such a timeless, graceful beauty. I love your photos and your beautiful long hair. Fantastic blog!